This chenille tapestry "Olde World Cracked Urn" shows an ornate urn among columns and archway. Here in this piece, the classic urn of ancient Roman or Greek culture is seen in lovely red and green gold tones. The columns and foliage garlands above echoes these colors and tones, set on a dark background. This lovely chenille tapestry gives an old world feel to your home and decor. 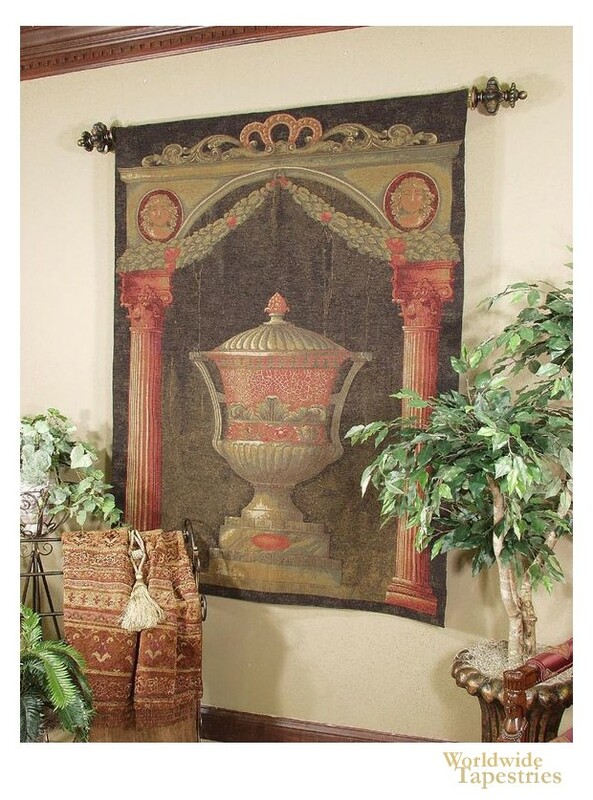 This Belgian chenille tapestry "Olde World Cracked Urn" is backed with a lining and has a tunnel for easy hanging. Note: tapestry rod and accessories, where pictured, are not included in the price. Dimensions: W 53" x H 73"